Next week, the circus is coming to town. Don’t expect a big parade through town, though. The entertainers are too small for that. The Southborough Library is bringing back children’s entertainer Ed Popielarczyk. But this summer, instead of showing off his magic or balloon twisting skills, he’s showing off his abilities as a circus trainer. 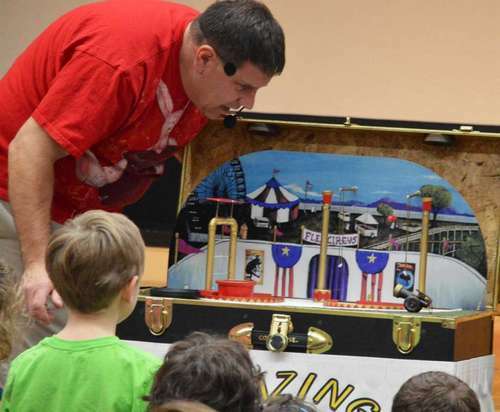 The showman will be bringing his “Flea Circus” to the Library. It is an entire big top circus in miniature!! First we have fifi, who performs on the high wire and the trapeze! Then there is Bruno, the worlds strongest flea who turns over a coin in a child’s hand! Last but not least is Fernando who does the high dive into a pool of water and gets shot out of a cannon and into a volunteer’s hands!! The audience will be thrilled and amazed at these and other incredible demonstrations starring Ed’s trained fleas. Don’t believe him? Click on the image above right to see Popielarczyk’s “publicity photos” for each flea. The fun will take place in the upper main level of the Library on Thursday, August 16 at 3:00 pm. The free family fun is sponsored by Fay School. No registration is required.